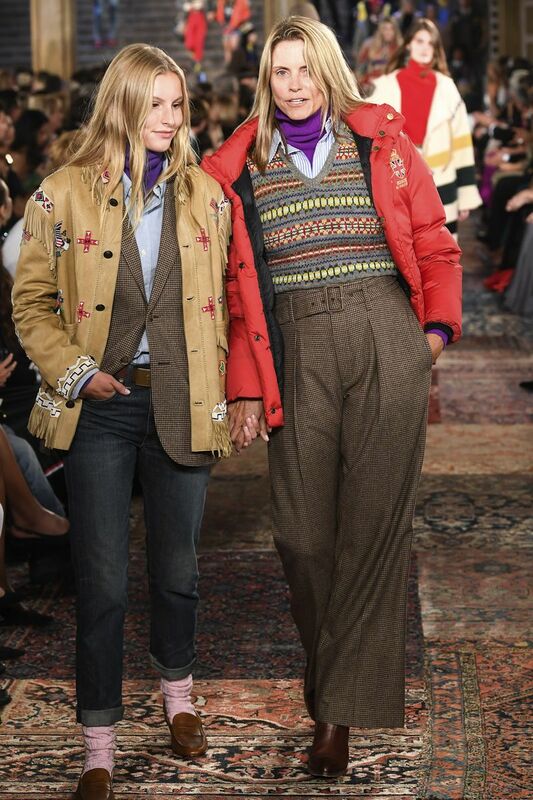 Half a century on, Ralph Lauren has risen to the top and maintained its position as a fashion front player. 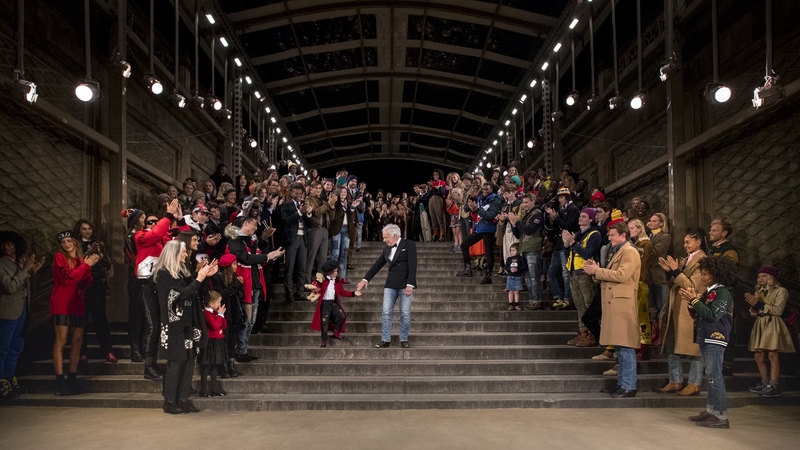 This spring/ summer 2019 season celebrated not just the brand, but Mr Ralph Lauren’s fashion legacy. With a guest list that rivalled the Met Gala – from Oprah to Spielberg and Blake Lively to Kanye West – the audience were sat against the backdrop of the Bethesda terrace fountain in Manhattan’s Central Park. Paul Simon’s ‘New York Is My Home’ began playing, signalling the beginning of an unforgettable show. The model cast was a cocktail of new faces mixed with the classic RL models like Caroline Winberg and Lisa Winkler – and including a handful of kids as the show progressed. The show was split into two parts. 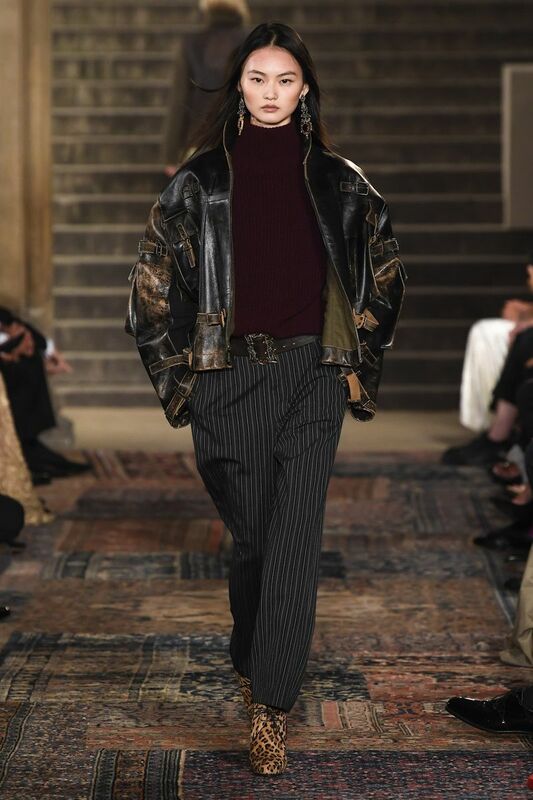 The first side of the collection had a western- inspired spirit to it, with patchwork fur capes with feathers poking out of it worn along with velvet skinny trousers, a variety of full length velvet evening gowns, oversized leather bomber jackets, heavy overcoats for men as well as three piece tailored suits made from thick wool. 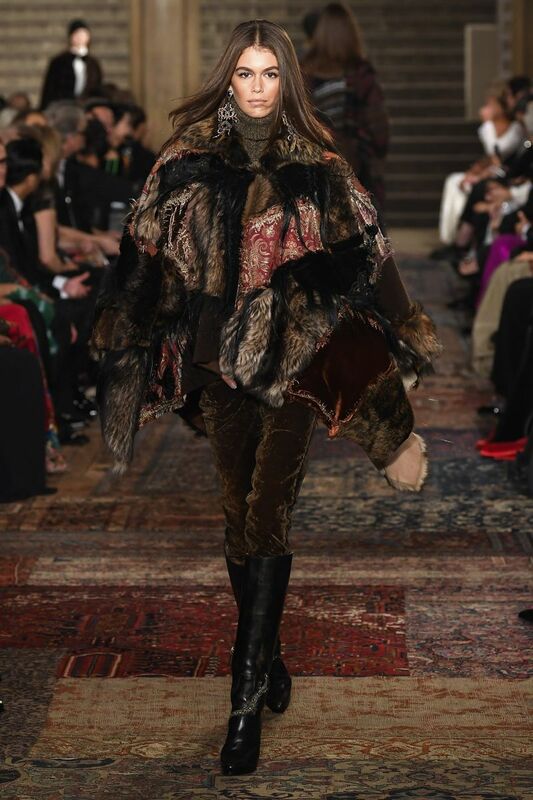 In theme with the celebratory feel of the night, the show created an eclectic cocktail of the different sides to the Ralph Lauren brand. 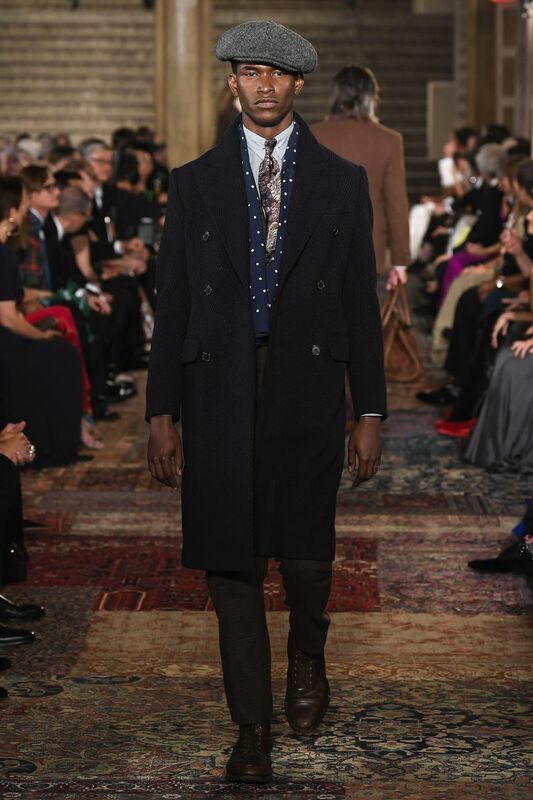 The first section mixed the Ralph Lauren Collection with the Ralph Lauren Purple collection, and the second section combined Polo Ralph Lauren and the Double RL line – creating a full circle of celebrating every part of the brand and the history. 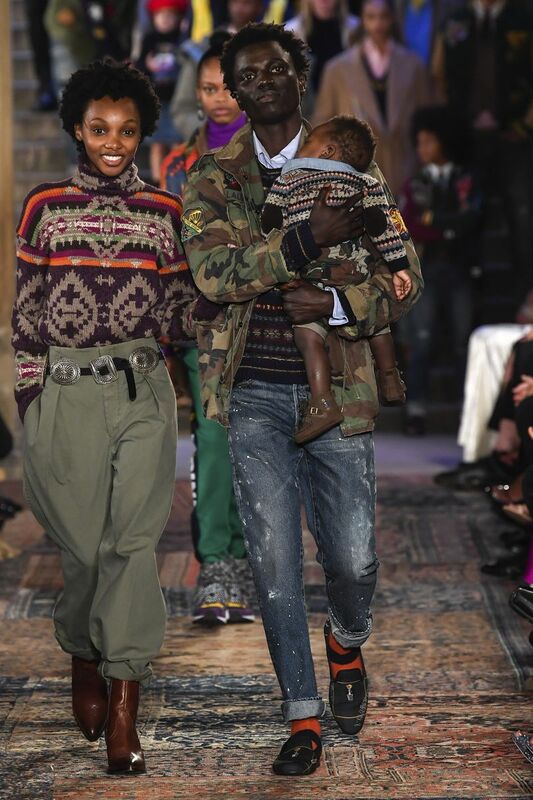 The second part of the show was more orientated around the family – an integral part of the Ralph Lauren brand as it caters fashion for all the family. It had more of a casual vibe as ethnically diverse duos or trios walked in looks that mixed formal attire with sportswear. 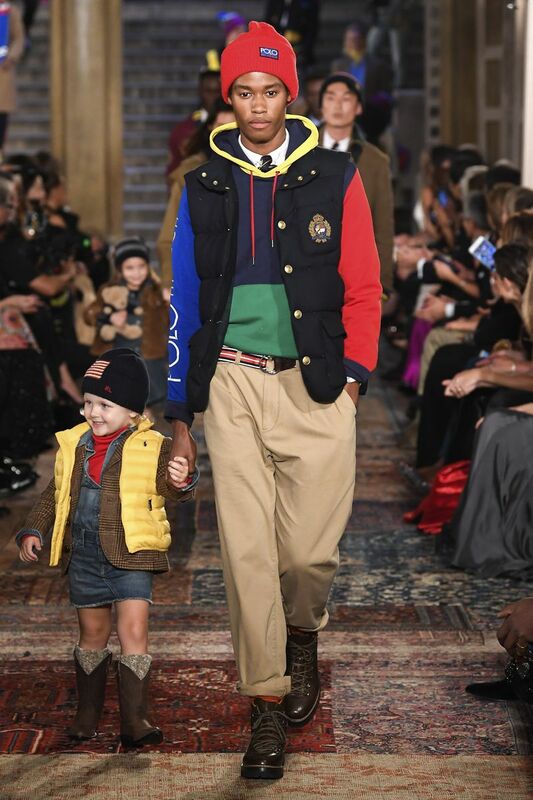 Camouflage trousers, baseball jackets, bright puffer jackets, loafers, knitted jumpers and blazers were mixed and matched to create that heritage American look that Ralph Lauren is so famous for. Ralph Lauren has lasted fifty years, and I think part of the success of this all-American brand is authenticity, and not straying too care from the key principles that it was founded on. Long may this brand continue to strive. Australian fashion brand Zimmermann stunned New York Fashion Week with its 70s soap ‘Number 96’ inspired spring/ summer 2019 collection. Creative director Nicky Zimmerman took inspiration from Sydney’s downtown revolution to continue its cocktail wear but with a more rock’n’roll twist. Low waist-ed tailored trousers, a tracksuit and spectrum of short dresses and two-pieces with intricate patterns and cut outs in golds, browns, white and turquoise blue. A beautiful yet edgy collection. Escada celebrated its 40th anniversary in New York this season, utilising the city’s international scale to showcase the German brand’s clothing. Global design director Niall Sloan has transformed the brand over the past two seasons producing bolder and brighter looks, and bringing back its archive logo prints. Founded in 1978, Margaretha and Wolfgang Ley named the brand after an energetic race horse called Escada they saw in the stalls of race track at which they were shooting at. With this in mind, the set was designed to look like a racetrack with a grass runway. Graphic logo print coats and skirt, oversized shirts, belted button up jackets and powerful suiting. Saturated oranges, pinks and reds were threaded through the collection, targeting the younger clientele yet keeping in tone with vintage print and gold accessories. The new Escada woman is powerful, yet with a laid back classic style.